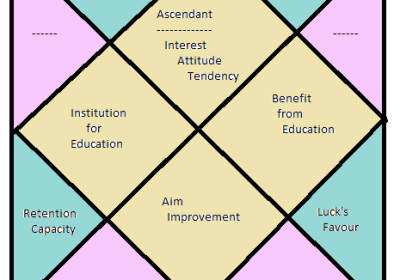 In VEDIC astrology, Education of a child is decided by certain principles.Generally 5th house is considered as the deciding house for education.But in my research, i observe that, many houses and all nine planets are responsible for education of a child. To get EDUCATION, one needs a financial backing, comfortable environment, proper guidance of teachers and a positive attitude. Besides all these, the most important thing is “interest in studies”. The time when human brain is most active and able to grasp the subject matter and the subject on which one can master are also important.HEALTH and LUCK are also important.Some children have tremendous memory power but less writing capacity,some have very impressive vocabulary with poor writing ability.So to have good Education one needs to have the support of all these. So in a kundali, the 1st,2nd,4th,5th,7th,9th,11th and 12th houses must be taken into consideration.The degree of planets and their position are other important factors which decide the accuracy.